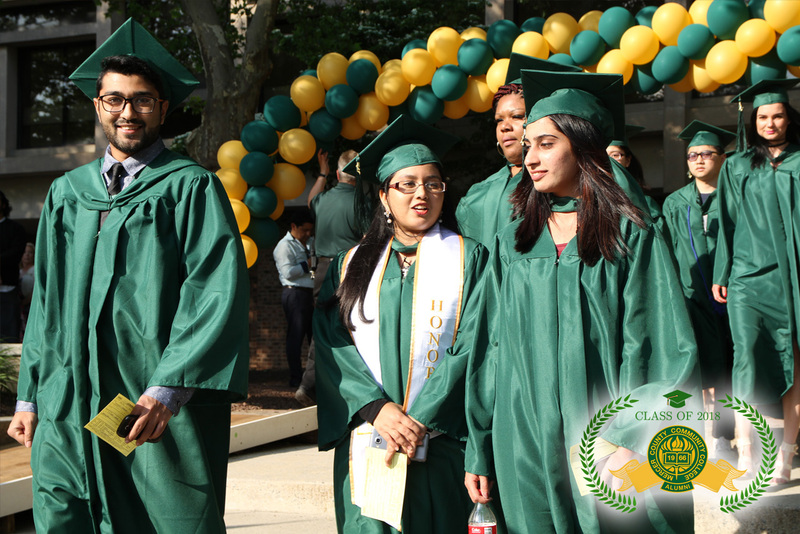 Friday, May 17, 2019 - 5:30 p.m.
Commencement exercises will be held in the West Windsor Campus Quadrangle at 5:30 p.m., Friday, May 17, 2019. All students participating in the commencement ceremony must be at their graduate assembly site by 5 p.m., dressed in their cap, gown and hood. Tickets are not required for outdoor seating. Invitations are included in the information packet supplied to graduates which is mailed the first week of May. For your safety and the safety of all of our families and guests, we request you kindly refrain from bringing backpacks and other bulky items to the ceremony. These items will not be permitted in the graduation ceremony area. Please review these instructions carefully. Your compliance will ensure that this distinctive ceremony is conducted with esteem and dignity. In the event of inclement weather, the commencement ceremony will take place in the gymnasium. The President will make the decision on the final location of the ceremony by 3:00 p.m. that day. If you are uncertain of the location, please call Security at (609) 570-3503 or the office of Student Life & Leadership at (609) 570-3435. The information will also be available on this website and the College's Facebook page. All graduates are to report directly to the gymnasium robed in proper commencement attire by 4:45 p.m. and sit in the area designated for graduates. There will not be a procession. A total of three guest tickets have been included in this mailing to be utilized in the event of rain only. Only graduating students and one designated guest ticket holder will be permitted in the gymnasium lobby area by 4:45 p.m.
Two guest tickets are for seating in either the Kelsey Theatre or the Communication Building for a live, satellite broadcast of the commencement ceremony. Your guests must have a ticket to gain admission to either building. Should you choose to have all of your guests seated in the same satellite viewing area, the gymnasium seating ticket may be used for admission to either building. Please make this decision in advance to reduce the amount of traffic in the gymnasium lobby area. PLEASE DO NOT MISPLACE THESE TICKETS. You must have a ticket to gain admission to the gym or other buildings. The event will also be broadcast live on MCCC's Channel 80/26/20. 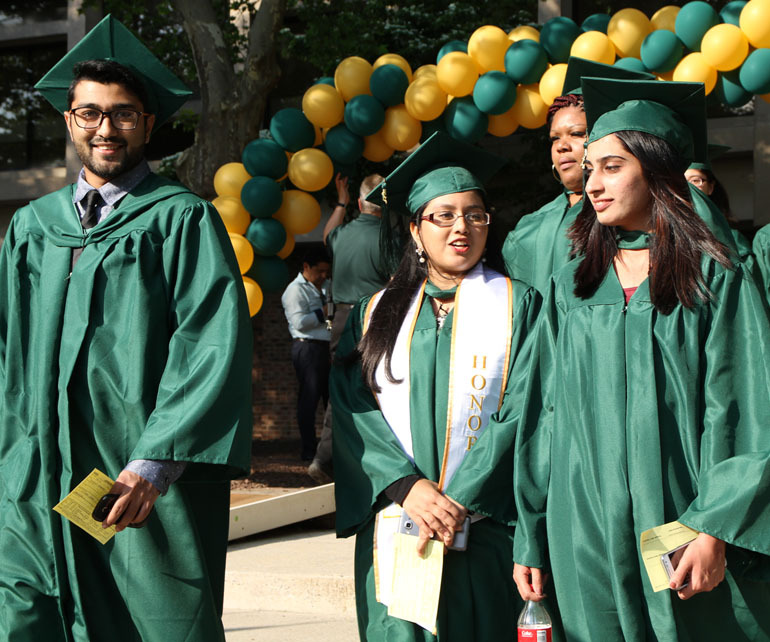 Caps and gowns are being distributed by the West Windsor Campus Bookstore beginning April 2. ALL graduates are to visit the bookstore during normal operating hours. There is no measurement done, you simply need to give them your height, and the attire is yours to keep. Your Student ID card must be presented to receive your cap & gown. All graduates are to assemble at their assigned outdoor areas according to program major. Graduates are asked to report to their assigned areas no later than 5:00 p.m. Graduates will lineup two by two. This double line of graduates will process in front of the Communication Building, down the stairs, and up the center aisle to seats in rows directly behind the faculty. Tassels should be on the right side of your cap. Graduates will join the processional march after the faculty. A double-sided yellow index card has been included in this mailing. Please fill out the card completely and legibly and bring it with you on the night of graduation. During the ceremony, you will hand your card to the reader as you approach the stage area. After submitting the card, you will cross the stage and receive a diploma jacket. You will then shake hands with the College President, Dr. Jianping Wang, and the Chair of the Board of Trustees, Carol Golden. A photographer will take your picture while you are shaking hands with the President and when you step off of the stage. Please return to your seat and remain there until all graduates have received their diploma jackets and the full ceremony is over. Ushers will be on hand to direct you through the procedure. Because the ceremony is televised, family picture taking is confined to designated areas. Please Note: DO NOT bring large pocketbooks, cases, cameras, etc., to carry in the procession, as they will bulge under the gown. You will not be able to leave these items in the assembly areas. It is suggested that high heel shoes not be worn, as they will sink into the grassy area in the quadrangle. TASSELS SHOULD BE ON THE RIGHT OF YOUR CAP. Graduates will join the processional march after the faculty. Program Order: National Anthem Remain standing. Honor Awards Dr. J. Brandon Shaw, Vice President for Academic Affairs, will ask those graduating "With Honors" to stand - first Highest Honors, then High Honors, and then Honors graduates. Honors graduates are to remain standing until all are recognized.